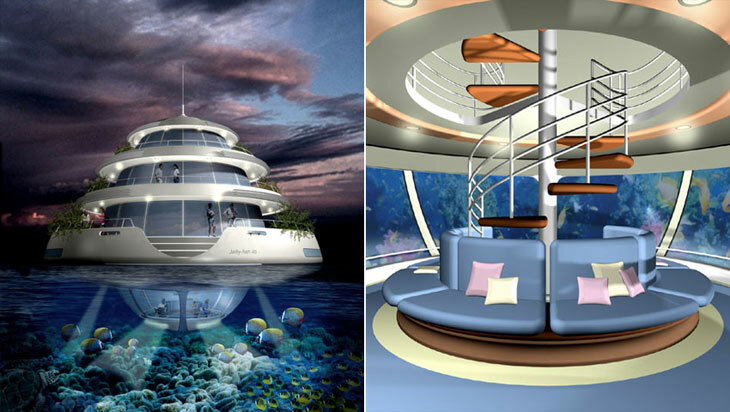 The Jellyfish 45 is a floating luxury living space from the Giancarlo Zema Design group. Intended for use in sea parks, atolls, bays and rich colorful seas the Jellyfish 45 stands from top to bottom 9 m high and 15 m in diameter. The concept houses up to six people on five levels connected by a central spiral staircase. The Jellyfish 45's top level sitting 5.6m above sea level is intended as a study room, below this are bedrooms and bathroom at 3.5 metres, down again and at 1.4 metres there are bathrooms and a kitchen. The semisubmerged level at 0.8 metres houses guest rooms, bathrooms and technical spaces. 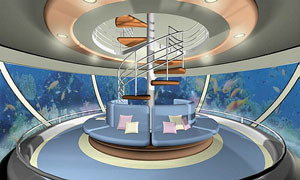 By far the most interesting aspect of the Jellyfish 45 is its lowest level at 3.0 metres below sea level, here the Jellyfish 45's occupants can get a 360 degree view of the underwater world from the dome like underwater viewing lounge. 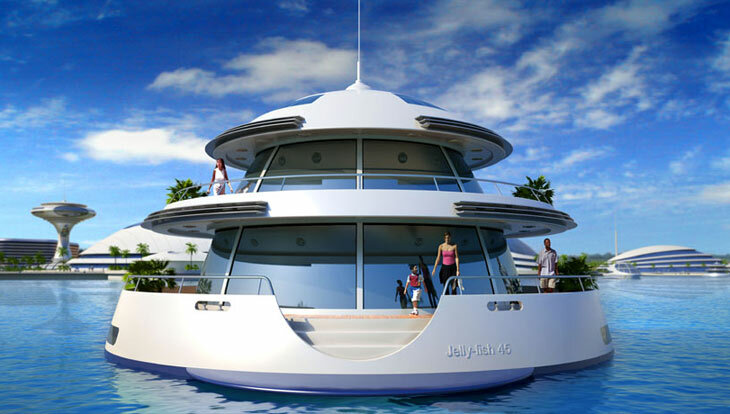 The Jellyfish 45 hull is constructed from steel with the superstructure in aluminium and the underwater dome is strong polycarbonate. Aesthetic inspiration for the Jellyfish 45 came from jellyfish - hardly surprising considering its name - and their unique form is mirrored in the overall shape of the concept.